For the longest time I was really directionless with some of my supporting equipment. Should I buy a chest rig? A Plate carrier? When I show up for a match how do I want to carry my gear? Initially I went the “cheap as I possibly could route”. I purchased something called “the better GI belt” on clearance for $7 bucks. Some website I found had a few double mag pouches on sale. I got a Glock holster for my pistol and Glock magazine holster. Really cheap stuff. It was made for guns and it was built for duty use, but overall it was just a non-intuitive setup. It flopped around. Reloads were slow. It worked, but poorly at best. At matches I would see people with some really nice gear. Full plate carriers, Molle, chest rigs integrated into molle, battle belts, ect. Those “all out” setups made me re-evaluate how I wanted to carry my equipment. The local competitions opened my eyes about why my first setup sucked, and it gave me a thought map to allow me to correct the deficiencies. I made up my mind to get something I could wear every day. I decided to go with a belt based approach and all the supporting gear. I ditched my old nylon GI belt for a more substantial system from www.thewilderness.com. The Wilderness Instructor Belt has been around a long time, but I just hadn’t spent the coin to buy one. It costs $39 measly dollars that I should have spent earlier in my firearm life. A 3 stitch model with a 1.75 inch width offers a steady platform for my accessories. The stiffness of the product keeps my support gear from flopping around which is oh-so-nice compared to what I was running. I have worn it every day onwards of two months, and it is awesome. This is a semi-review of the Instructor Belt, yes, but it isn’t the only game in town. There are many other quality belts on the market, just do your research. Tactical nylon belts are relatively cheap in comparison to chest rigs, armor carriers, ect. They offer a quick and affordable way to carry spare mags, your pistol, and a dump pouch. A quality belt will be stiff and it will spread the weight well. You can then, in turn, wear it every day for your concealed carry setup. All these items are affordable and readily available. For $150 or so dollars, you could have a complete setup that will make life easier during your first competition. I have seen new shooters come out with no real way to carry spare mags other than their back pocket. First off, I am glad they are at the competition! 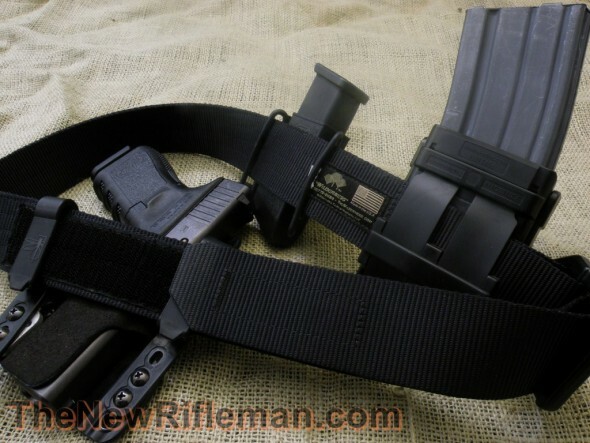 …but life would be some much easier with a good belt and a good mag pouch. If you can’t afford the initial costs, go to the competition anyway; you can feel out what other people are using, what you like, and what will fit inside your budget. If we, as a nation, are ever called to defend our liberty with the bark of a rifle… it will be much easier to run that gun with extra mags and good support gear wouldn’t it? ← The Best Prices on Trijicon Acogs are at… Amazon?